It is also recommended that you have a dedicated redundant FT network with minimum 1GB pNics for the FT traffic. In our current infrastructure we are limited to the number of physical nics we can present to the ESXi hosts due to the blade chassis we are currently using. 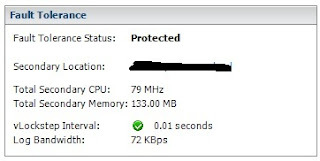 We were unable to allocate 2 nics to dedicate to FT so we never really utilized FT.
We recently had a requirement to move our DMZ to our ISP and thus reused some decommissioned Dell R610 hosts. We bumped up the memory and pNic count and now we could comfortably allocate 2 pNics per host for FT. We use a Citrix Access Gateway (CAG) VPX appliance for remote access to both published apps and desktops and although this is protected with VMware HA, FT offered more protection in the event of a complete host outage. The only issue that I had was that the CAG was not on the supported list of OS's but it seems to work fine.